ORIT GAT | Mon Nov 28th, 2011 10:35 a.m.
Kodak stopped manufacturing 35mm slide projectors in 2004, a decision in line with the company’s current focus on digital photography. 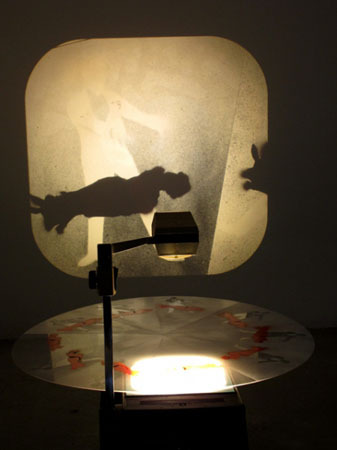 The website dedicated to Kodak slide projectors has been archived as a frozen version, current as of November 2004. 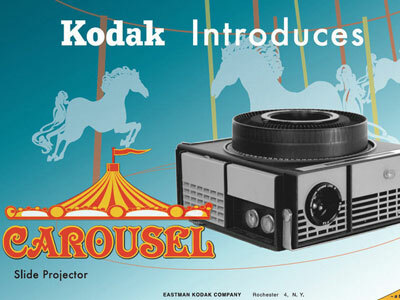 Soon enough, that website would seem as old fashioned as the famous poster celebrating the invention of the carousel slide projector. 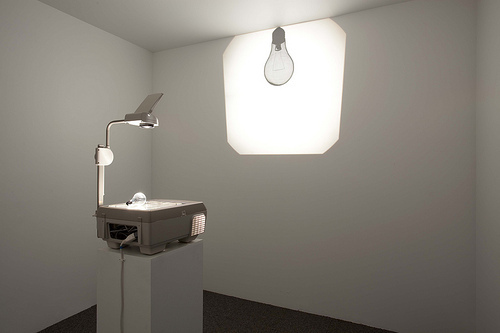 In 2005, shortly after Kodak’s announcement that it will no longer produce slide projectors, curator Darsie Alexander at the Baltimore Museum of Art organized the exhibition “Slideshow.” Featuring nineteen works made between the 1960s and the early 2000s by artists such as Robert Smithson, Dennis Oppenheim, Ceal Floyer, and Dan Graham, “Slideshow” celebrated the medium itself. It was presented in a series of darkened rooms where the only light came from the slide projectors and the sound of the changing slides echoed throughout. Most art history classes are now taught using PowerPoint. We are getting more and more accustomed to viewing art digitally and online, insomuch that Google used its Street View technology to also make available virtual visits to museums across the world as part of Google Art Project. And the performative aspect of the PowerPoint is utilized in Pecha Kucha and Slideluck Potshow events. 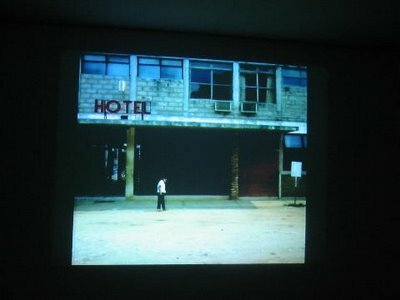 Maybe it is time that we throw thinking about the slideshow as a curatorial project into the mix. What worked for Baltimore Art Museum’s “Slideshow” will not work with PowerPoint, whose physical characteristics are quite different. This entry was posted in Photographs, Writing. Bookmark the permalink.